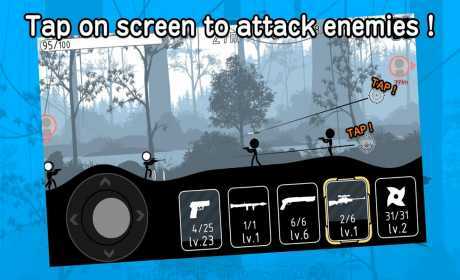 Control your character, Stickman the good guy, moving forward and defeat the enemies! Simple movement and attack actions. Dodge enemies’ attacks and hit their weakness! 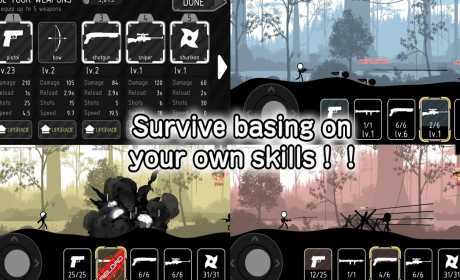 For start-up, your stickman will equip a pistol with normal power, after that stronger weapons will be revealed. With a short gun you can shot multiple enemies at once. With a bazooka you can blow-up a robot! Depending on the circumstances your choice of weapon becomes really important! You can use money rewarded to upgrade weapons after unlocking them. After getting upgraded, weapon’s power and total bullets will increase. 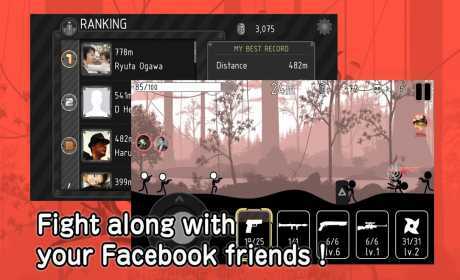 Connect to Facebook and you can clear stages with your friends who are also playing Stickman Striker, or compare your high-score to theirs. Bullets will follow your touch point on the screen.